There's only one thing worse than NASCAR, and that's anyone who calls NASCAR a sport. And yet here I am, spending money to make a toy look more NASCAR-y. Well shucks howdy, pass the chaw! If you got the US release of Leadfoot, then Reprolabels kit M39 is really more of an optional buy. 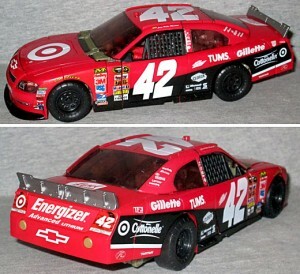 Since the toy was a Target exclusive, it had the big Target logo on the hood, and several sponsor stickers on the sides. Sure, it was a little bit bare compared to the real #42 car, but it wasn't terrible. On the other hand, the Japanese release skips all the details - all the details. 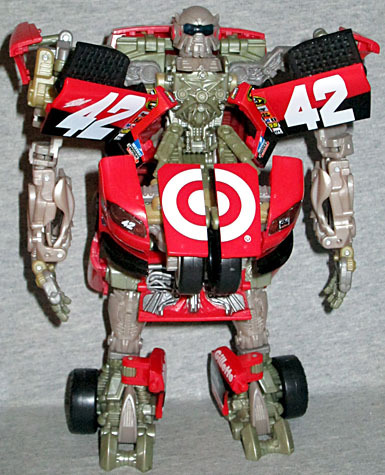 No bullseye, no logos, no numbers, no nothing other than red paint, black paint, and a tiny Autobot symbol on the side. In that case, the stickers are almost a necessity. At $10, the sticker kit may seem rather expensive, but you're getting more than 50 individual stickers for the price (68, if you get the Japanese one). We're talking details for the grill, the tires, a big piece across the trunk, and dozens of new sponsor logos! They're a mixture of traditional decals and the fancy vinyl ones, depending on how they need to look and what they need to cover. A note on the robot mode: I'm using (some of) Matt Booker's tips on improving Leadfoot's transformation, so the robot mode seen here doesn't exactly match the one seen in the review, but you can still appreciate the difference the stickers make. All the decals went on in the altmode, so there's nothing left to do at this point, but he looks better than he used to. More complete, for lack of a better term. This offering isn't as much of a mandatory purchase as Knock Out's kit was (and there are no nifty little videos to teach you how to put the stickers on), but the final product is a big step up in quality. Yee-haw!